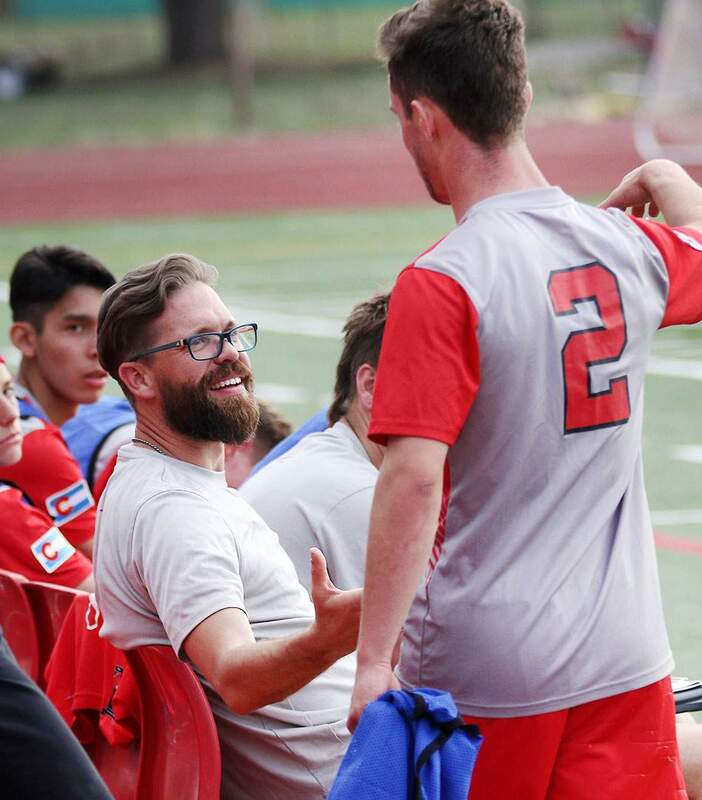 Head coach Aaron Champenoy of the Durango High School boys soccer team congratulates senior forward Jack Beattie as he comes out of the game for a rest while playing Glenwood Springs in August. The Demons earned the No. 4 seed in the Class 4A CHSAA Boys State Soccer Championship bracket and will play Steamboat Springs on Wednesday. The Durango High School boys soccer team was given the No. 4 seed in the Colorado High School Activities Association Class 4A Boys Soccer Championship tournament when the playoff bracket was released Monday morning. The Demons will host No. 29 seed Steamboat Springs at 6 p.m. Wednesday at Durango High School. CHSAA uses a Ratings Percentage Index (RPI) to seed teams in the playoffs. Teams are scored based on their strength of schedule, with a formula that calculates wins of a team’s opponent and wins of that opponent’s opponents. Durango finished with an RPI score of 0.644116, while Steamboat Springs had a score of 0.536385. When first-year Durango head coach Aaron Champenoy first saw that the Demons would face Steamboat Springs, he knew it would be a tough first match. “I was thrilled for our guys to see that we got a top-four seed, and we took care of business throughout the season in order to get it done,” Champenoy said. “But still, when I saw Steamboat Springs, I knew it was going to be a really good test for us. 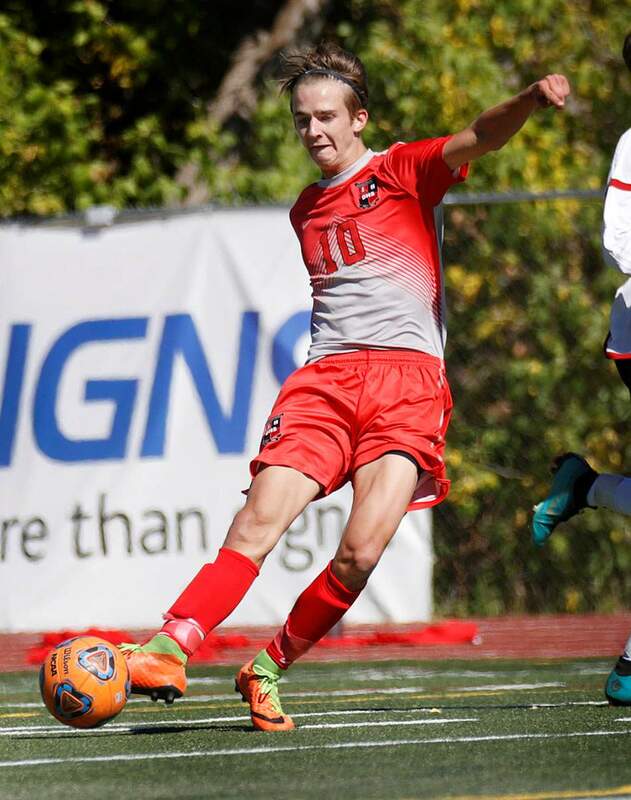 They’ve got a great one-two punch with a great midfielder in (Riley) Moore and a good striker in Murphy Bohlmann, who was 14th in the state in goals. They combined for 29 assists and 21 goals, so we’re definitely going to have our hands full. Durango (13-0-1, 7-0-1 5A/4A Southwestern League) won its sixth consecutive league title when the Demons defeated Fruita Monument 2-0 last Friday in the regular-season finale. Champenoy inherited a senior-laden squad, and the veteran presence has been strong on both ends of the pitch, as the Demons tallied 57 goals and gave up just 15 goals all season. Their first-round opponent will not be an easy test, however, as the Sailors (9-4-2, 7-3-2 4A Western Slope League) led their conference with 76 goals and also have the state’s leader in assists in Moore, a senior midfielder who registered 29. Steamboat Springs head coach Rob Bohlmann said that for all the seasons he’s been coaching, the Sailors have never crossed paths with Durango. Logan Fullington of Durango High School fires off a shot at goal while playing Montrose High School at DHS. Fullington leads the team in goals with 13 and points with 35. The two head coaches share contrasting experience when it comes to playoffs at the high school level. Bohlmann has been involved with the Sailors program since 1987, when he began as a volunteer assistant coach. Last season, Steamboat made a quarterfinal appearance and also led the program to a string of semifinal or state championship game appearances in the mid 1990s. On the other side of the coaches box will be Champenoy, who will make his first postseason appearance at the high school level since 1999, when he led Burke High School in Omaha, Nebraska, to the state tournament. However, Champenoy more than makes up for the years of not being involved in the high school game. He spent the last two seasons at Hastings College, an NAIA power also located in Nebraska, and won the 2016 national championship. Champenoy tested his team more than ever in the days leading up to Wednesday’s game. “From the beginning of the season, I’ve said we’ve got to be the hardest working team on the pitch, and now that we’re at the business-end of the season, it’s making sure that everybody knows what their responsibility is,” he said. While the Demons will have to zero-in on the Sailors’ one-two combo, they have a trio of their own players. Senior forward Logan Fullington leads the team in both goals (13) and points (35), while junior midfielder Leland Heinicke is not far behind with 12 goals and 28 points of his own. Senior Lance Townsend has found the back of the net 11 times and has 27 points. Champenoy is hoping his side will approach the playoffs with a “quiet storm” mentality.